A reminder last week about the important role that consumer protection laws play in public health, and in holding – in this case – a food manufacturers accountable. 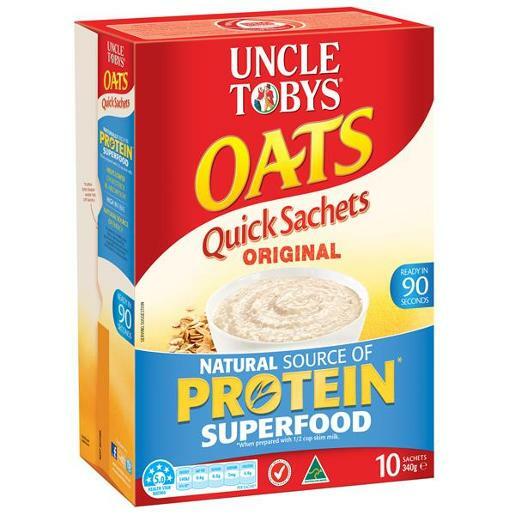 Cereal Partners Australia, which owns the Uncle Tobys brand, has paid a penalty of $32,400 imposed by the Australian Competition and Consumer Commission for allegedly making false and misleading statements about the protein content of porridge. Uncle Tobys labelled its oat porridge satchets as “protein superfood”*, adding in small print “*when prepared with [1/2 or 2/3] cup of skim milk”. This was not enough to satisfy the ACCC, which felt that the dominant impression created by the packaging was that oats are high in protein, when this is not the case. Provisions in the Competition and Consumer Act 2010 (Cth) permit the ACCC to issue an infringement notice as an alternative to taking court proceedings against a person or company for breach of a range of provisions in the Australian Consumer Law (ACL), as well as many other provisions in the Act itself. [Reckitt Benckiser, which manufactures the painkiller Nurofen, was not so lucky: the ACCC launched Federal Court action against the company for misleading statements made about the ability of Nurofen products to target particular kinds of pain. The Court has ordered that Nurofen products for back, period, migraine pain and tension headaches be removed from shelves]. The Australian Consumer Law in contained Schedule 2 of the Competition and Consumer Act 2010 (Cth) . It commenced operation on 1 January 2011. It is a single, national law covering consumer protection and fair trading. It contains revised versions of provisions in the old Trade Practices Act, as well as provisions from Fair Trading Acts at State level. It implements agreements reached by the Council of Australian Governments (COAG) in 2008 to create a single, national consumer law. The Australian Consumer Law applies at Commonwealth, state and territory level. Part 3-1 of the ACL contains a range of provisions relating to false or misleading representations. In issuing three infringement notices against Cereal Partners, the ACCC would appear to have been referring to breaches of provisions in ACL Part 3-1, such as s 29, which provides that a person must not, in trade or commerce, make false or misleading representations about the standard, quality or composition of goods purchased by the consumer. By claiming through its advertising that oats are rich in protein, the ACCC took the view that Uncle Tobys was making false or misleading representations. According to its nutrition panel, one serving of oats gives you 4.4g of protein: about 9% of daily recommended intake for a normal adult. Uncle Tobys was fined $32,400; that’s 3 X $10,800 for each of the 3 infringement notices issued. That’s probably a few minutes of revenues for Cereal Partners Australia, which is the Australian subsidiary of Cereal Partners Worldwide, a joint venture between Nestle SA and General Mills Inc. But it’s still 6,700 times larger than a 10 pack of oats satchets, which retails for $4.83 at Coles. When trust is such a vital ingredient for sales and revenues, the publicity given to penalties provides part of the wider incentive structure for food manufacturers to avoid false and misleading statements in their advertising. In addition to advertising Uncle Tobys oats as a protein superfood on its packaging, the manufacturer ran TV advertisements claiming that “UNCLE TOBYS Oats with milk are naturally rich in protein which helps build muscles… and they’re a superfood”. A disgruntled viewer made a complaint to the Advertising Standards Board, which administers a number of voluntary codes , including the AANA Food & Beverages Advertising & Marketing Communications Code (the “Food Code”). The Board’s determination is here (0225/15). The Board did not consider the term “superfood” was misleading; however, it did consider the advertisement breached section 2.1 because it suggested to a reasonable viewer that the product was naturally high in protein and failed to “make sufficiently clear that the product needs to be combined with milk to achieve the heightened nutritional content of protein”. Unlike the ACCC’s action, the ASB’s determination received no publicity that we are aware of. Wouldn’t it be clearer for consumers if food manufacturers focused their advertising on the nutritional characteristics of their product, rather than the nutritional features of quite separate products which – if consumed at the same time – can yield the nutritional benefits that are claimed?